Reading vital records written in a foreign language can be challenging. But we genealogists quickly become proficient at locating family names even among words that are otherwise illegible. The image above came from a roll of film (#1898553) at the Family History Center. The film contains birth, marriage and death records for Hellimer, Moselle, Lorraine, France. Each year has an index which I scour for the surnames in my family tree. When I find a Schmitt or Gury in the index, I fast forward to the date it mentions. Pierre’s naissance or birth is #7 in 1843. Do you see where his record begins, on the left side of the page near the bottom? Schmitt is a common name, so before I can do the genealogy happy dance, I have to ensure this Schmitt is my Schmitt. Count down five lines of text until you see Nicolas Schmitt – this is Pierre’s father. Knowing a little French helps; Nicolas is vingt neuf ans or 29 years old. My 3rd great-grandfather Nicolas was born in 1813, so this name and age are correct. Now count down three more lines. The last word is Marie. The ninth line begins with Anne Gury. My Nicolas Schmitt was married to Marie Anne Gury, who was born in 1818. This Marie Anne Gury is vingt cinq ans or 25 years old. We have a match! 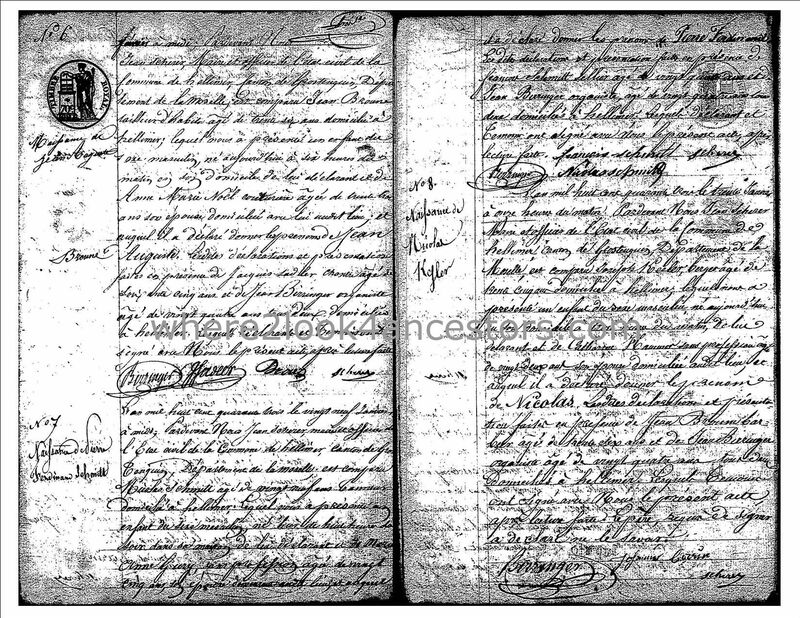 For real help reading French records, visit the FamilySearch Learning Center.